In an advance that helps clarify the role of a cluster of neurons in the brain, Yale School of Medicine researchers have found that these neurons not only control hunger and appetite, but also regulate bone mass. The study is published Sept. 24 online ahead of print in the journal Cell Reports. "We have found that the level of your hunger could determine your bone structure," said one of the senior authors, Tamas L. Horvath, the Jean and David W. Wallace Professor of Comparative Medicine, and professor of neurobiology and obstetrics, gynecology, and reproductive sciences. Horvath is also director of the Yale Program in Integrative Cell Signaling and Neurobiology of Metabolism. "The less hungry you are, the lower your bone density, and surprisingly, the effects of these neurons on bone mass are independent of the effect of the hormone leptin on these same cells." Horvath and his team focused on agouti-related peptide (AgRP) neurons in the hypothalamus, which control feeding and compulsive behaviors. Using mice that were genetically-engineered so their cells selectively interfere with the AgRP neurons, the team found that these same cells are also involved in determining bone mass. The team further found that when the AgRP circuits were impaired, this resulted in bone loss and osteopenia in mice—the equivalent of osteoporosis in women. But when the team enhanced AgRP neuronal activity in mice, this actually promoted increased bone mass. "Taken together, these observations establish a significant regulatory role for AgRP neurons in skeletal bone metabolism independent of leptin's action," said co-senior author Karl Insogna, M.D., professor of medicine, and director of the Yale Bone Center. 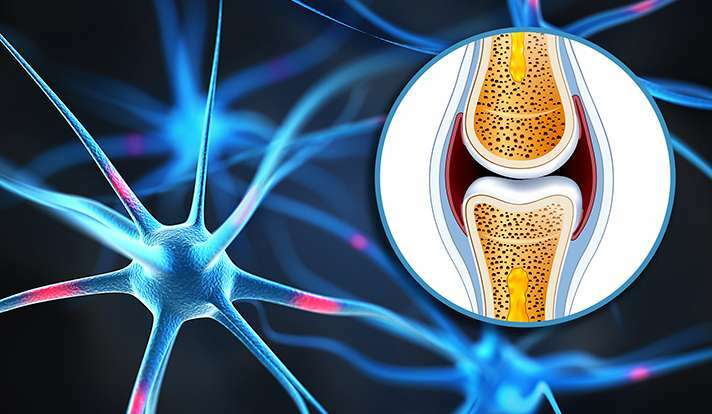 "Based on our findings, it seems that the effect of AgRP neurons on bone metabolism in adults is mediated at least in part by the sympathetic nervous system, but more than one pathway is likely involved." "There are other mechanisms by which the AgRP system can affect bone mass, including actions on the thyroid, adrenal and gonad systems," Insogna added. "Further studies are needed to assess the hormonal control of bone metabolism as a pathway modulated by AgRP neurons."